When I was just starting out, the most scary thing to me was trying to figure out the technical aspects of actually starting a blog. The second scariest was probably getting my writing out there, but that's a story for another day! If you are hoping to start a blog that becomes your next side hustle or full-time business, then this tutorial is for you! I'm happy to say that starting a blog really isn't as technical or complicated as it looks, and I'm hoping that this tutorial will make it simple for you. In fact, setting up a blog only takes about 15 minutes. Ready to get started? Quick note: I highly recommend bookmarking this post! It super long and thorough and you'll likely need to come back to it a few times. 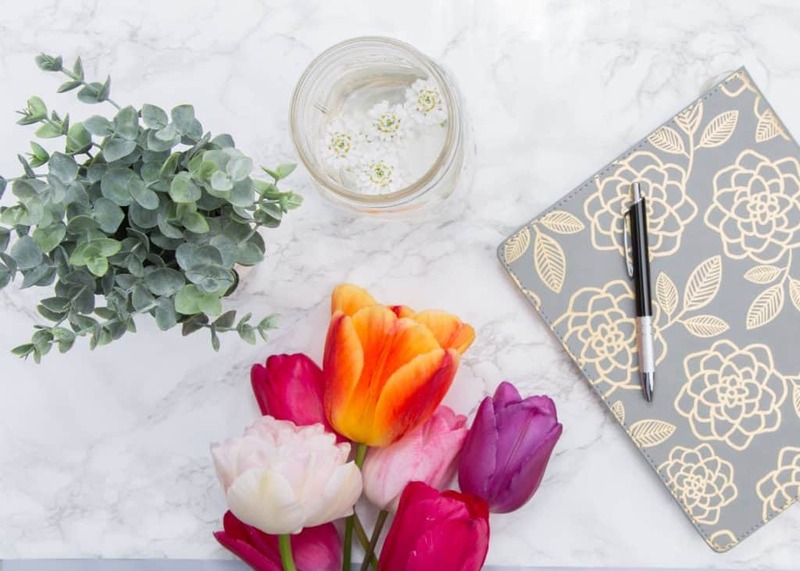 If working from home writing about things that inspire you sounds like the business plan for you, it's time to start a blog! Blogging is an incredible way to share your ideas with the world and make money doing it. On top of that, the start-up costs are extremely low. You can expect to spend less than $300 to start your business off on the right foot. Your first step is to choose a niche. I absolutely recommend writing about something that you truly love and are knowledgeable about. It's simply too difficult and time-consuming to do otherwise. Keep in mind that there are dozens of sub niches for each of the topics above. Spend some time brainstorming a list of things you love reading about and doing in day-to-day life. Once you've chosen your blog topic, it's time to start your blog! This is the first set of options you will see when you visit Siteground. 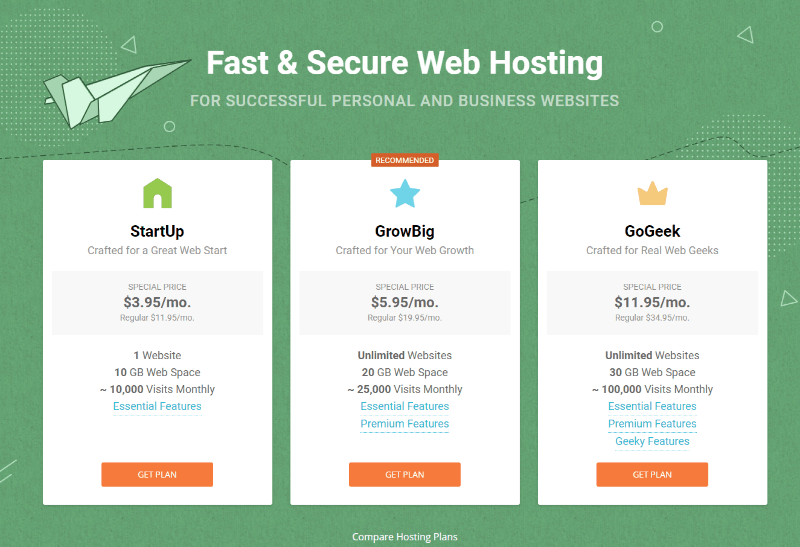 Go to the Reliable Web Hosting section, and click "Get Started". I purchased the StartUp plan from Siteground for my blog. The little extras on the GrowBig and GoGeek plans really aren't needed in my opinion. If you already have a domain name you've purchased elsewhere, you can choose that option instead. If you're starting a new blog, however, you'll want to register a new domain name. Choosing your domain name is an important step, but it isn't the be-all-end-all of your business. For many people I highly recommend reserving yourname.com. It's what I use for my blog and seems to do really well for others. Using your own name gives you a lot of flexibility and helps you build a brand around you! This is a great perk because it will allow you to pivot your business in the future should you need to. That being said, there are some downsides. One, for example, is if you have a pretty complicated name like I do. My name isn't exactly easy to remember, which is something I took into account when I started my blog. If you have a name that is difficult to spell or pronounce, it might be better to go with a blog name that relates to what you will be writing about instead. Creative names are a great option if you're pretty sure of what you will be writing about and don't think you'll deviate from that blog topic too much. Creative names are also a lot of fun, and they're generally pretty easy to remember too. The next step is to fill out your account information and pay. When you get to the Purchase Information section, you'll see that they give you the option to buy a trial period, 12 months, 24 months, or 36 months. It's up to you which you choose, but I highly recommend choosing either the 12, 24, or 36 month package. 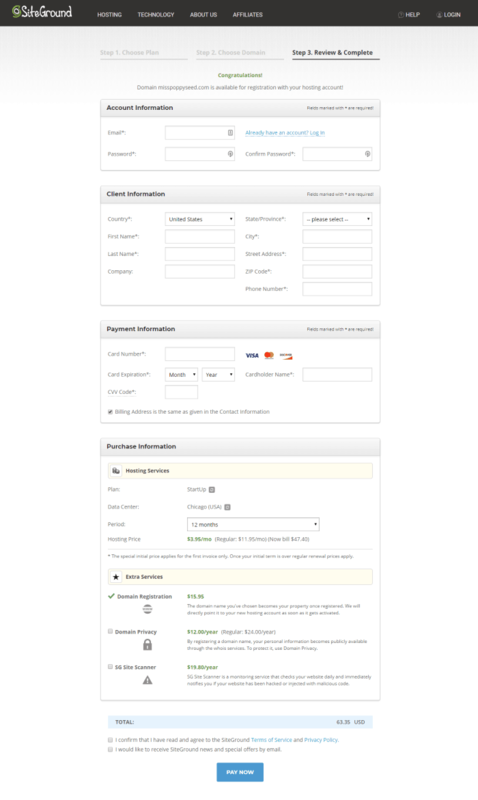 The reason is that these packages give you the domain registration for free, whereas the trial month option doesn't. Do you need Domain Privacy and SG Site Scanner? After you've selected the package you wish to buy, you'll see a couple of options to add on domain privacy and SG Site Scanner. I don't recommend anyone buy these because they simply aren't necessary. SG Sitescanner is their web security product that they encourage everyone to buy, but to be honest you can get the same level of protection from FREE WordPress security plugins. If it would make you feel better to have these, then I say go for it! But otherwise, I'd pass on them. I love that Siteground makes it so easy to connect to WordPress. It's a free feature, and it makes setting up your blog really simple. Here's how to install WordPress on your Siteground account. Step 1: Login to Siteground, click the "My Accounts" tab, and then click "Go to cPanel". Step 2: Click "Proceed" when the pop up asks you to securely access the cPanel. 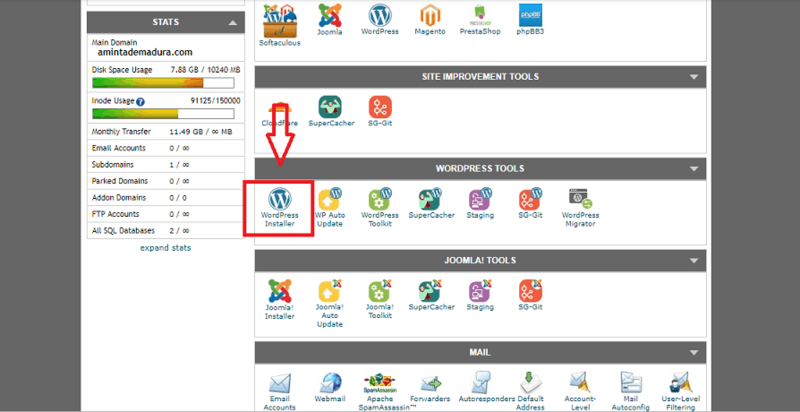 Step 3: Scroll down to the "Wordpress Tools" section and click the "Wordpress Installer" button. Step 6: Click "Install" one more time. Once Siteground and WordPress are connected, you'll be able to see your new WordPress page! This is your main dashboard that allows you to create posts, add plugins, customize your look and feel, and so much more. If you followed step one above, you now have a basic blog set up on a free template. Your next step is to choose a solid blog template that will help make your blog a business. Free templates glitch frequently and could cause downtime on your site. Free templates almost never have much in the way of support, so if something breaks you will be on your own. Many of the WordPress plugins you need to run your business won't integrate well with a free template. I use the Thrive Minus theme and the Thrive Architect drag and drop builder. I've tried a number of different themes over the years, but this one is by far my favorite. It is clean, simple, and Architect makes it so easy to build pages exactly the way you want them. Plus, Thrive offers a number of other super useful web building products like their quiz builder, opt in builder, and comments. Here's how to install your new theme and Architect builder. Install the Thrive Product Manager. Install and activate your theme. Install and activate Thrive Architect. Drag and drop the building block you want to use onto any part of your post. Google Analytics is a free service provided by Google that tracks tons of data regarding your website and visitors. It's an absolute must-have tool that every successful blogger uses. And thankfully, it's really not hard to set up! Google Analytics will show you how many visitors are coming to your blog each day, where they're coming from, your most popular posts, and a ton more. This is information you will need down the road to figure out what kind of content your visitors really love, which pins and traffic sources are bringing most of your visitors, what percentage of them convert into email subscribers and buyers, and other important metrics. Here's a simple tutorial on how to install Google analytics tracking. Now that your blog is set up and ready to rock, it's time to put some of your ideas out there! I recommend sitting down and brainstorming a few pillar post ideas. What the heck is a pillar post? A pillar post is a big, thorough post that guides your reader to a certain outcome. Pillar posts are called that because the content creates a pillar or backbone of your business. If you aren't sure what to write, think of the three biggest topics you want to talk about on your blog, and then create a pillar post for each of them. For example, a travel blog might create a pillar post called “The Ultimate Guide to Travel Hacking with Airline Miles”. The point is that for each of the subtopics on your blog, it's a great idea to have a big pillar post that serves as the backbone of that subtopic. Once you've written your pillar content, all of your other blog posts should interlink nicely with your pillar posts. These posts are long and thorough and set the stage for the rest of my blog posts. They also easily interlink with my other posts, making navigation easier for my readers. I recommend writing your first two or three pillar posts first and then branching out into other related content. Learning how to use Pinterest is by far the fastest and easiest way to get traffic to your blog. To this day it is still my number one source of traffic. Pinterest is perfect for new bloggers because it gives you the chance to get your blog posts out in front of thousands of new people instantly. Here's how to start getting traffic right away. A) Set up your business account. You'll need to become a business account before you can apply to rich pins (step 2). Creating a business account is easy. 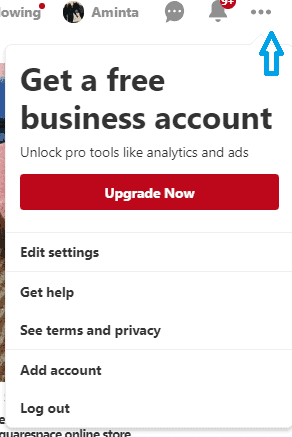 If you started with a personal account, you can convert it by clicking on the three dots in the top right corner and then clicking the "Upgrade Now" button. If you are completely new to Pinterest, you can start off by creating a business account from the very beginning. Once you've created your business account, you'll need to verify your website. Read this tutorial on claiming your website here. Follow this tutorial to enable rich pins on your Pinterest account. Enabling rich pins is a critical step to making sure your account looks professional, and you get the most traffic possible. Once you apply for rich pins and are accepted, all of your pins will automatically feature your name and the correlated board name below the pin. C) Add 5-10 boards about topics you plan to write about. The next step is to create boards that relate to your blog topic. You can see below that I have a number of different boards that all tie into personal finance. I recommend starting with 5-10 boards in the beginning. After that, make sure to add a couple of boards per year to keep your Pinterest account fresh and thorough. You'll also want to make sure to use keywords in your board titles and description. Keywords help Pinterest know what your boards and pins are all about. When Pinterest understands your topics, you'll start to see traffic flowing in easily. D) Fill your boards with 25-50 pins per board. Now you want to give Pinterest a little help in figuring out what your boards are all about. Spend a couple hours and add 25-50 high quality and related pins to each of the boards you've created. You can find pins in your home feed, or you can search for them in the search bar at the top of Pinterest. Adding related pins will help Pinterest identify your topics and see them as a valuable resource for other pinners. E) Create 3 pins for each of your blog posts. You'll probably notice that on each of my posts you see one pin image for my readers to save. But that doesn't mean it's the only one! Not only do I add one pin image directly onto each of my blog posts, I also create two more and upload them directly to Pinterest. Not only is this a best practice for maximizing how much traffic you get per post, Pinterest has come out and encouraged everyone to create multiple pins per post! F) Add your pins to every board that is relevant to that topic. Once I've created a pin, the next step is to add it to every board I have that is relevant. On top of that, I'll also add it to all of my business and blogging related group boards. This will help get my pin in front of as many eyes as possible. G) Add your pins to Tailwind Tribes. If you only do one task on Pinterest, make it this one! Adding my pins to Tribes really helped my blog get off the ground, and I still see residual traffic from them today. Tribes are a feature of Tailwind that allow a group of contributors to share their pins with each other and quickly get repins (which leads to traffic!) At first blush Tribes might sound like group boards, but they are better. Tribes requires everyone to repin other people's content with a 1:1 ratio for posting their own. So that means that for every one of your own pins you add to Tribes, you must repin another person's pin. This is a great feature to have, because it ensures that contributors are actually saving other people's pins, rather than just dropping their own and then leaving. If you want to start getting eyes on your pins and people clicking through to your site, I highly recommend signing up for a Tailwind account and joining some Tribes. Want to learn more about how I get thousands of visitors from Pinterest every month? Check out my best strategies for winning on Pinterest here. This next step is absolutely key to making money with your blog. You need an email list! An email list is a group of people who love your blog and want to hear more from you. This is where you deepen the relationship with these readers by offering extra information and occasional promotional materials. If you've never heard of an email list before or are unsure how to start one, don't worry. It's really not that complicated. But please, please don't skip this step! The number one mistake new bloggers make over and over again is not starting an email list at the very beginning. Even if you don't have anything to sell right now, you should still start building your email list right away. Here's how to build an email list that is primed and ready for when you DO have something to sell. A) Sign up for Convertkit and write your welcome email. It's reliable. Emails get delivered without issue, and my open rates are much higher than with free services like Mailchimp. It was designed for bloggers. Convertkit was actually created by a blogger who couldn't find an email provider that had all the features he needed, so he created his own! It's pretty intuitive. Honestly, I really can't stand complicated software. I don't have time to put 25 hours into learning how to use a new interface. Thankfully, I've found Convertkit to be pretty intuitive, and their how-to guides are useful and thorough. Their forms are ugly. Like really, really ugly. Thankfully, I've found a way around this. I now use Thrive Leads and Thrive Lightbox (which comes with Leads) to create beautiful forms that then connect to my Convertkit sequences. 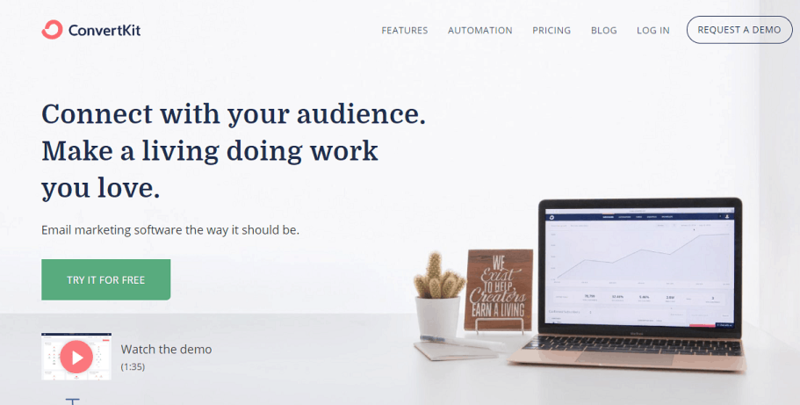 Connecting the two is easy- Thrive Leads integrates with Convertkit so you don't have to do anything. 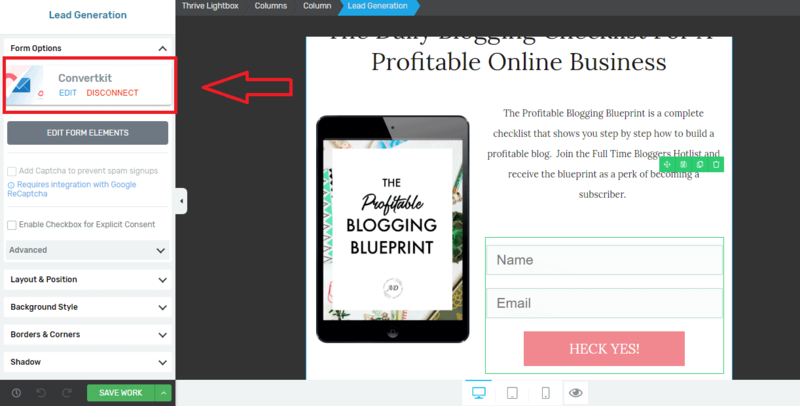 You can see below how I connect my Thrive opt-ins to Convertkit. Once you have a Convertkit account, you'll need to set up a form and a sequence to be in business. 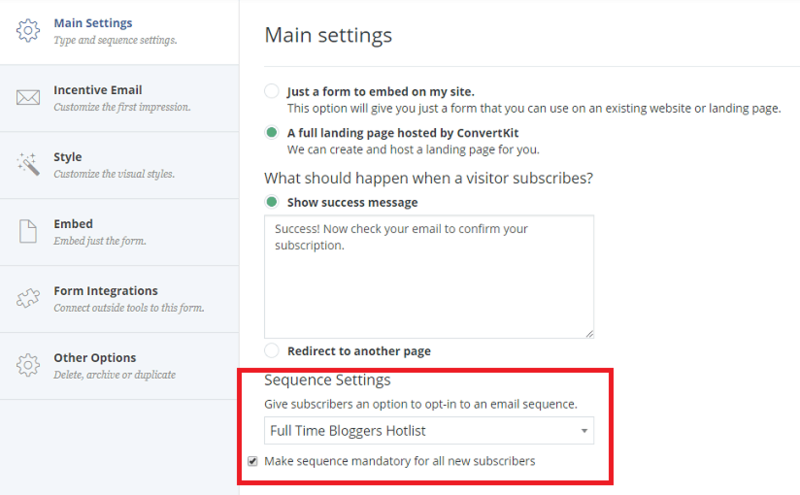 Simply click on the "Sequences" tab at the very top of the page, and then click on the red "New Sequence" button to create your sequence and write your first welcome email. This email will be automatically sent out to everyone who signs up through your form. When you create your form, it will ask you which sequence to connect it to. Go to the settings tab, and you'll see at the bottom of the Main Settings area that you can choose which sequence you'd like the subscribers of that form to be placed on. B) Create an opt-in freebie. The next step to building your email list is to create a freebie! This could be any type of digital file that you think would really help your readers: a PDF, audio MP3 file, an ebook, a report, a webinar, a video, whatever fits your audience! My Profitable Blogging Blueprint is an interactive, clickable checklist that puts all of the business building steps in order to help other bloggers create profitable online businesses. I made this freebie first as a PDF. Then I imported it into Adobe Illustrator and added all of the clickable and fillable areas to make it a more interactive experience. 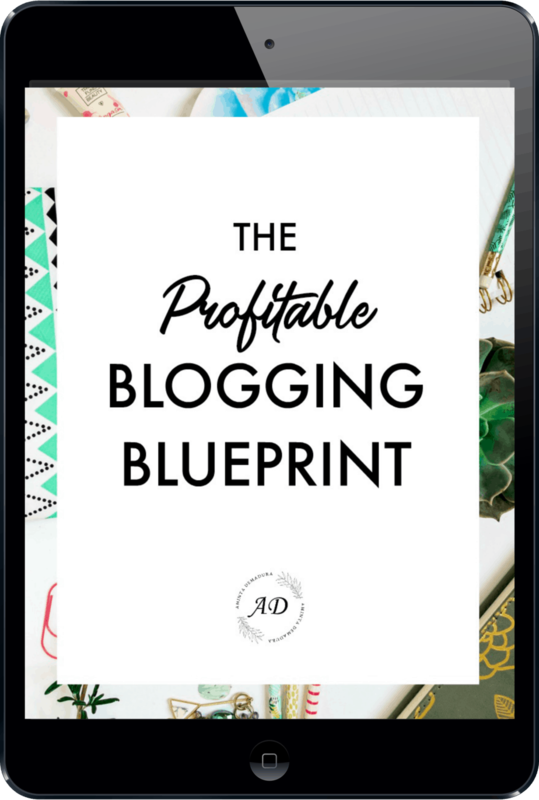 Want to grab the Profitable Blogging Blueprint for yourself? Simply sign up below to receive it in your inbox right away. C) Create your opt-in form to gather email addresses. Since I've decided that Convertkit forms are too ugly for me to use (what can I say? I'm picky! ), I created the form above using Thrive Lead's fun feature, Lightboxes. Creating simple and attractive forms is super easy, because the whole thing is drag and drop! You can see in the image below how I simply choose which feature I want to use, and then drag it onto the part of the opt-in form I want it to be. Once you've created your opt-in form with Thrive Leads, you'll be able to use that exact form on any page or post you want. You can set it to be a static form (like the one above), or you can have it automatically slide in after a certain number of seconds. This is the best way I have found so far to naturally build my email list. D) Place opt-ins all around your blog for people to find. It's important to make sure that you place your opt-in in enough places around your blog to make sure that people notice it. I recommend finding at least 3 spots on your blog for your opt-in form to live. Of course, you don't want to annoy your readers so don't go overboard. Keep it natural and helpful. E) Keep in touch with your subscribers. You've done all the work to get set up, and you've written your welcome sequence. By the way, your welcome series can be single email or it can be a handful of emails- up to you! The last step to creating a profitable blog using your email list is to keep in touch with your subscribers! After all, you don't want them to forget who you are. If you're short on time, just send a short email once every few weeks. You can always send more down the road. And trust me, when it comes time to launch your own product or promote your affiliate products, you'll be SO GLAD you took the time to set up your email list. These things take time to build, so it's best to start as soon as possible. For me, traffic has really come down to using Pinterest properly. There are a lot of ways to generate traffic to a blog, but for many of us Pinterest is the 80/20. It's the 20% of effort that gets us 80% of the results. When I got serious about making a living from my blog, I decided to invest in a well-reviewed Pinterest course and ended up purchasing Pinterest Traffic Avalanche. And I'm so glad I did! My traffic doubled just a week after I started implementing the strategies in PTA. Alex and Lauren are the creators of Pinterest Traffic Avalanche, and they really walk the walk. If you check out their Pinterest profile (CreateandGo), you will see that they receive millions of monthly views and make more than $150,000 per month (yes, month!) from their blog. They've really got this Pinterest thing figured out and I was so grateful to learn from them. If you're serious about making money from your blog, I highly recommend giving Pinterest Traffic Avalanche a chance. Steps 1-7 are really the backbone of your whole blogging system. They are the parts that bring the traffic, sign up the email subscribers, and track the data. Once you've done these things, it's time to make some money! 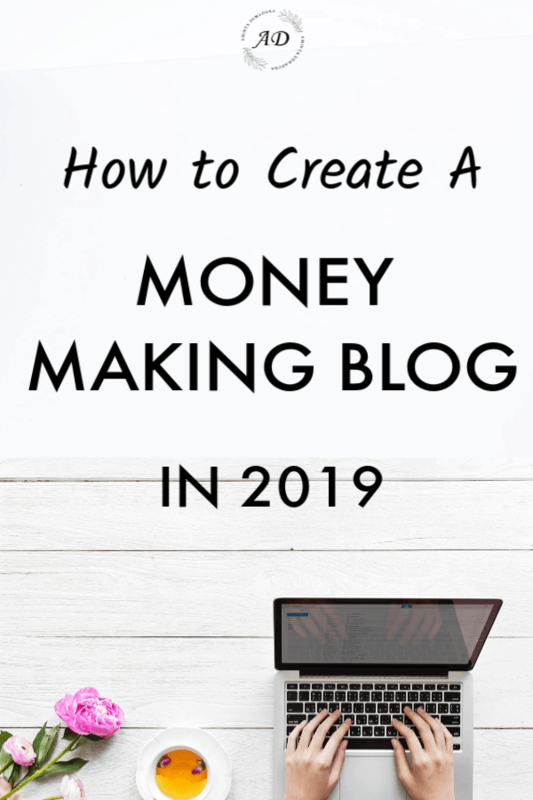 Hopefully you've thought a little bit about how you will plan to make money with your blog, but if you haven't, that's okay too. There are tons of different ways that bloggers make money with their blogs, and yours is no exception. 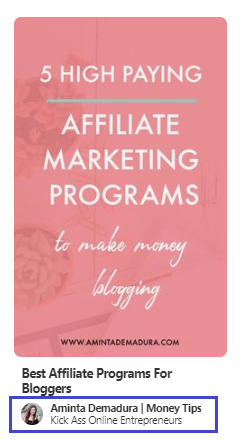 I recommend reading my post How Bloggers Really Make Money and choose 2-4 monetization strategies that sound like they would be a good fit for your blog. Now, that's not to say that you should start trying to implement all of the strategies at once. It's a much better idea to pick just one right off the bat and thoroughly implement it and tweak and test until it is working well before you move on to other strategies. At this point you're blogging system is set up, you're seeing a trickle of income coming in, and you're blogging your little heart out. This is the time for growth. One of the most important lessons I learned in Alex and Lauren's Six-Figure Blogger course was that successful bloggers create content that sells. It's too easy to just write for the sake of getting a blog post up there. That won't grow your income however. It's so important to create content that both helps your reader and helps you move closer to your income goals. How do you make money with your blog? What monetization methods are you using successfully? Every blog post you put out there should help support these goals. I highly recommend checking out Alex and Lauren Six-Figure Blogger course for a complete step-by-step action plan to creating a blog that earns you more than $100,000 per year. They currently make $150,000 per month from their blog, which is why I found their knowledge so invaluable.